Where the rich go to play and we go to watch! The islands off Cape Cod are enchanting destinations. Martha's Vineyard, in particular, paints a vivid portrait. The chic, the super rich, Walter Cronkite, the President and a Black Dog, a bridge on Chappaquiddick, film crews and jaws, all portray a very alluring destination. Just a short sail from the mainland, the Vineyard features pristine sandy beaches, natural beauty, golf courses, bike trails, nature preserves, lots of history, and more than a standard share of sun&fun-seeking celebrities. So who is Martha? A 17th century celeb? In a way. The 17th century exporer Bartholomew Gosnold, who "discovered" the island replete with wild grapes, named it for his youngest daughter. Brightly colored Gay Head Cliffs (Aquinnah) looking toward the Elizabeth Islands and Wood's Hole. The shortest approach to the Vineyard is via Wood's Hole. 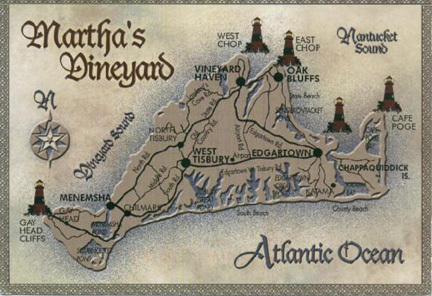 It's a straight shot over to Vineyard Haven, Oak Bluffs, and Edgartown, all on the eastern seaboard of the Island. 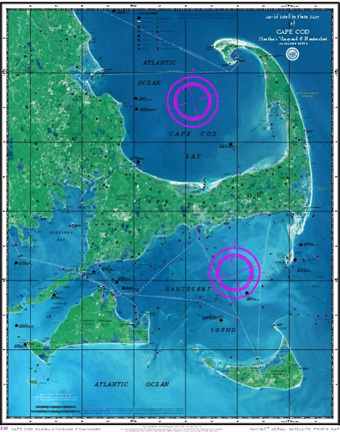 Menemsha, on the southwestern end, requires a bit of careful navigation over the shoals in Vineyard Sound from Wood's Hole or directly across via Quick's Hole from Buzzards Bay. Of course, passing around Cuttyhunk on a lovely day provides a great view of Gay Head from sea level. Edgartown Harbor is most pictureque. Click on any of the links above to learn more about each destination. Or read an article about the differences by clicking here. 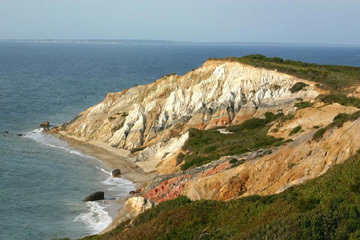 The western end of the Island consists of three small towns: West Tisbury, Chilmark and Aquinnah. This part of the Vineyard is called "Up-Island" an expression from seafaring days because as you travel west you move up the scale of longitude. Up-Island's beautiful vistas encompass the air, the sea, and the land reflecting the mood of the weather. Ancient paths and structures date back to times when the Wampanoag Indians hunted for deer and colonists farmed the land. South Road is in part the original Indian footpath. The King's Highway established in colonial days still runs unpaved in places, offering ideal trails for horseback riding. Stone fences, protected by law, are reminiscent of the sheep farming prevalent during the 17th century. Hmmm, better than a Dunkin' Donuts stop. Only on the Vineyard! Gay Head or Aquinnah, it's Native American name, is quite stunning, with its multicolored cliffs; again the parking is limited on beautiful sunny days. Gay Head overlooks Cuttyhunk and harbors sacred ancient Indian grounds. The indigenous Aquinnah Indians tell of how the giant god Moshup was irritated by sand in his moccasins and threw them into the sea; one formed the Vineyard. The second day we rented mopeds instead and drove all around the perimeter of the island with the wind whipping around us. You can find parking for a moped much more easily than a car, so if it's not pouring, we'd recommend this option. 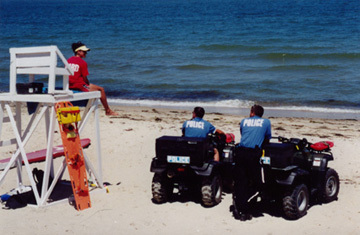 Beaches on Martha's Vineyard are popular destinations. The third day, we rented bicycles. Now this was the ticket. The island has a bicycle path running the entire length down the middle, as well as a circle tour around the perimeter, and it's relatively level all the way - perfect for weekend warriors like us. About 30 miles later, having observed windmills, charming cottages, spectacular vistas and farms en route, we collapsed exhausted from the workout. You can also take a bicycle over to Chappaquiddick, visiting the mostly deserted Chappy beaches, the oriental landscapes at Mytoi Gardens, and the Poucha Pond reserve. The Martha's Vineyard Agricultural Fair is an interesting way to pass some time if you happen upon it. They have shuttle buses from the major towns. You can ride a ferris wheel, admire goats and cows, and watch draught horses pull sledges of huge cement blocks weighing 8,000 pounds. Pretty impressive, actually. Then as night falls, there might even be a fiddling contest. 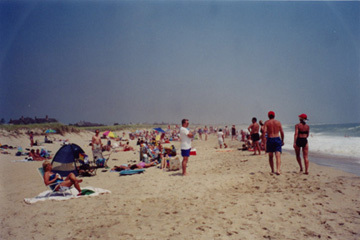 Of course, the beaches, the fishing, and the horsebackriding are all activities that can make an MV holiday exceptional, that is if you can break away from the people watching in Edgartown. As an alternative to lazing on the beaches, the Vineyard has miles and miles of walking trails open to the public to enjoy. Edgartown: Town finger piers for pleasure crafts. Ramps at Anthier's Landing into Sengekontacket Pond, and Katama Bay, Collins Beach. Oak Bluffs: Town dock with slips for power boats. 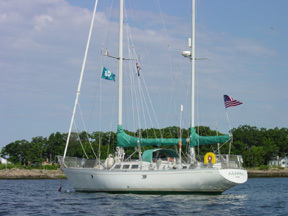 Contact Marina Manager for slip reservations: (508) 693-4355. Moorings are first come first serve. Ramps at East Chop Drive & Medeiros Cove. Vineyard Haven: Dock at Owen Park. Ramps at Lake St. into Lake Tashmoo & Lagoon. 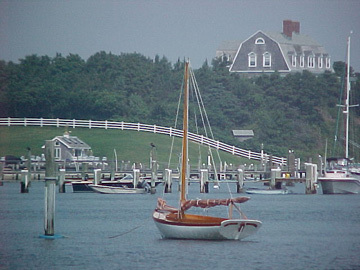 (Contact Harbormaster for Mooring info) Edgartown, Oak Bluffs, Vineyard Haven, and Menemsha all have Harbormasters whose duties include dock maintenance, law enforcement, boating safety, assigning moorings, and assisting disabled vessels. Click here to read about Walter Cronkite and Martha's Vineyard. Aerial photo of Cape Cod, with Martha's Vineyard in the lower left and Nantucket in the lower right. 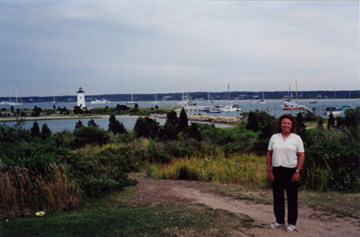 Martha's Vineyard just across Vineyard Sound from the Elizabeth Islands and Woods Hole. Not for Navigation.